Having originally purchased a Fitbit One and loving it, when the Fitbit Flex came out I decided to upgrade to that and retire my Fitbit One. A lot of my friends were still satisfied with their Ones, and I felt kind of guilty just chucking my old Fitbit One into the cupboard — so I figured: why not duct tape it to the cat instead? It would probably be pretty interesting to know how many steps Java does, especially during the day when no one is around the house. I had some big, important, very serious questions in my mind: Does he walk around when humans aren’t around? What are his most active hours? How much does he adventure during the middle of the night, when cats are supposedly at their peak? 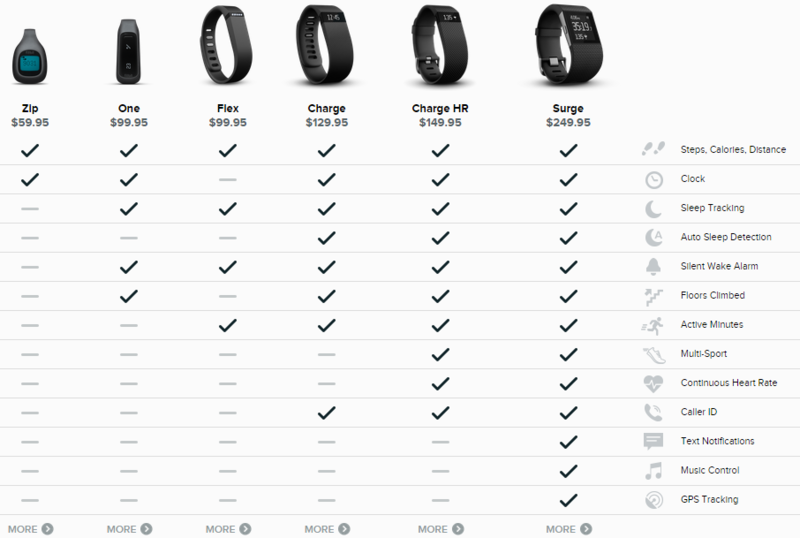 All of this and more could surely be answered by trusty, and available, old Fitbit One. Simply, I removed the cat’s collar from his neck, duct taped the Fitbit One case clip to his sparkly pink collar band, and then reattach the collar to his neck. Worked like a charm. Java wearing his Fitbit tracking device, showing that he has taken 7,971 steps today. No wonder he’s tired! He does approximately 6,000 steps a day. The upper bound of his steps lies at 12,432 steps on the 31st of August, 2013. He exhibits regular patterns of movements each day. He is active from about sunrise, which is generally around the sametime someone in the household wakes up and feeds him breakfast. He is then active for 4 or 5 hours till just before midday, where he stops for a rest. Waking up and moving around again irregularly during the afternoon, he returns to his slumber usually at around 4 or 5 p.m. till 8 p.m., when he is fed dinner. Then he seems to be active again for another few hours, retiring for a bit between midnight and 2.a.m., where he often display short bursts of high energy and where he gets his highest step count in. It’s interesting to note that his highest active time is between midnight and 4 a.m., which is generally the least active time for humans. Java is mostly an indoor cat, with access to a catproofed backyard. Java managed to escape from the house for four days in early June, 2014. When he finally returned, I took a look at his Fitbit stats in order to get a vague indication of whether he ventured far from our lot. It was interesting to find that he actually made very little steps during his four days of absense, and generally didn’t move at all until the period before he returned home. 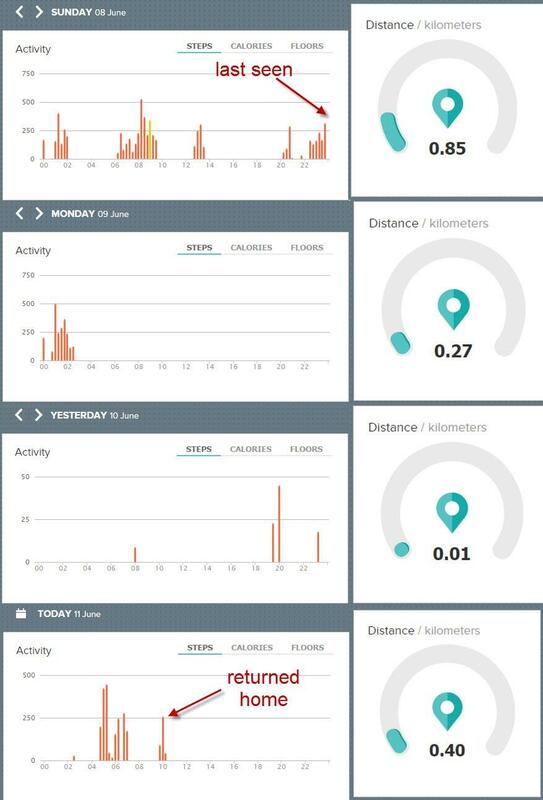 Java’s Fitbit statistics over the period he was missing, indicating when he was last seen and when he returned home. As you can see in the statistics above, there was very little activity from him while he was gone, and even his activity just before he left and just before he returned home didn’t exceed 500 steps. This indicates he probably got stuck in someone’s garage or some other confined space for a couple of days, before the garage was opened again or he managed to find an escape route. 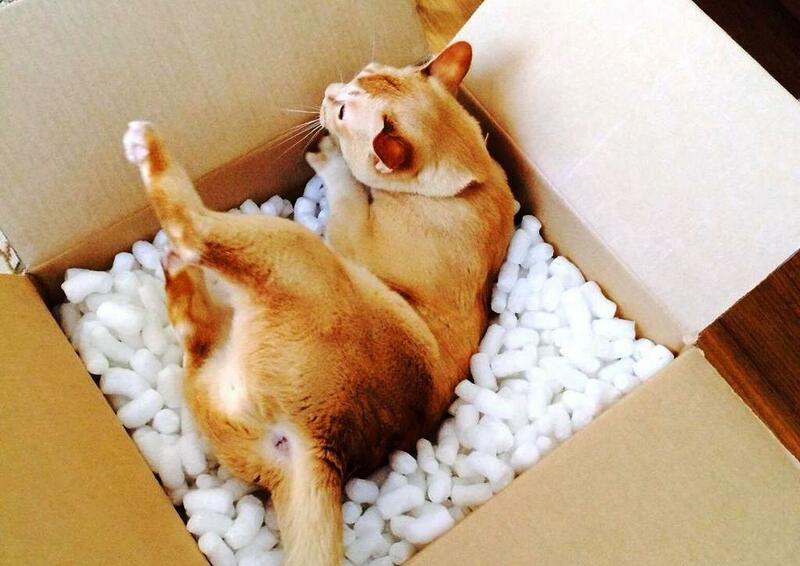 Java “enjoying” a shipping box filled with packing peanuts. It’s an exciting time for wearables and quantified self tracking. This also means that there are more options for pets! Thanks to lowering prices of compact smart tech and crowd-funding solutions like Kickstarter, pet oriented life tracking is becoming more common. A Kickstarter project that I have backed is Pawtrack, which focuses more on locating your cat than just counting its steps. The Pawtrack device is a collar replacement that contains a GPS chip and a SIM card built-in. This enables you to view your cats current location from anywhere in the world through the use of a web browser. A similar device is Whistle, designed for dogs but could be reasonably used on a cat too. This device, similar to a Fitbit solution, concentrates on tracking the pets activity and rest, as well as having a built in GPS. The Whistle solution looks interesting as the GPS locations of your pet periodically sync automatically, sending your mobile device alerts to significant changes to activity levels (indicating that the pet may have escaped). Fitbit recently announced a range of new Fitbit devices selling in three flavors: Fitbit Charge, Charge HR and Surge. A screenshot comparing the various Fitbit devices (note: the Fitbit Force is not included in this comparison due to Fitbit’s voluntary recall of these devices). This screenshot was fetched from fitbit.com/comparison/trackers — this site will only accept views from the US. Unfortunately, due to these options not allowing for the device to be detached from the wristband like in the Fitbit One and Fitbit Flex, none of these three new Fitbits seem appropriate for pet tracking. The Surge device in particularly would have been beneficial as it is the first device released by Fitbit that contains a built-in GPS chip. Where to find Java — and more! One of the features of the Fitbit fitness tracking devices is that you can have your daily steps count automatically tweeted to your Twitter account each night. Having attached Java’s Twitter account, @zzaps_cat, to his Fitbit account, Java’s account tweets each day the number of steps he has done. Similarly, because I am Twitter addict, my Twitter account, @zzap, also tweets my daily Fitbit steps. I also frequently post photos of Java which his account often retweets. There are also a few other individuals who have attached a Fitbit to their pets, including Ed Hunsinger, who donated his Fitbit to his cat not long after I set Java’s up. You can find his blog post about it here, and @bunki_cat‘s Fitbit profile here. Other spinoffs also include @Tsu_Cat, a Fitbit and Twitter combination account whose owner also liked the idea. Do you have a spare Fitbit or similar type of fitness tracker and feel like your pet would just love to know how many steps its doing? Put it on them and join the club! There are a number of Fitbit groups you can become a member of, or follow the various Twitter accounts of quantified pets — including Java’s Twitter profile: @zzaps_cat. Don’t forget to also follow me on Twitter at @zzap, where I occasionally post the musings and photos of living with Java. Just love your post w/all the info and great pics of Java! Great idea! Loved the blog. 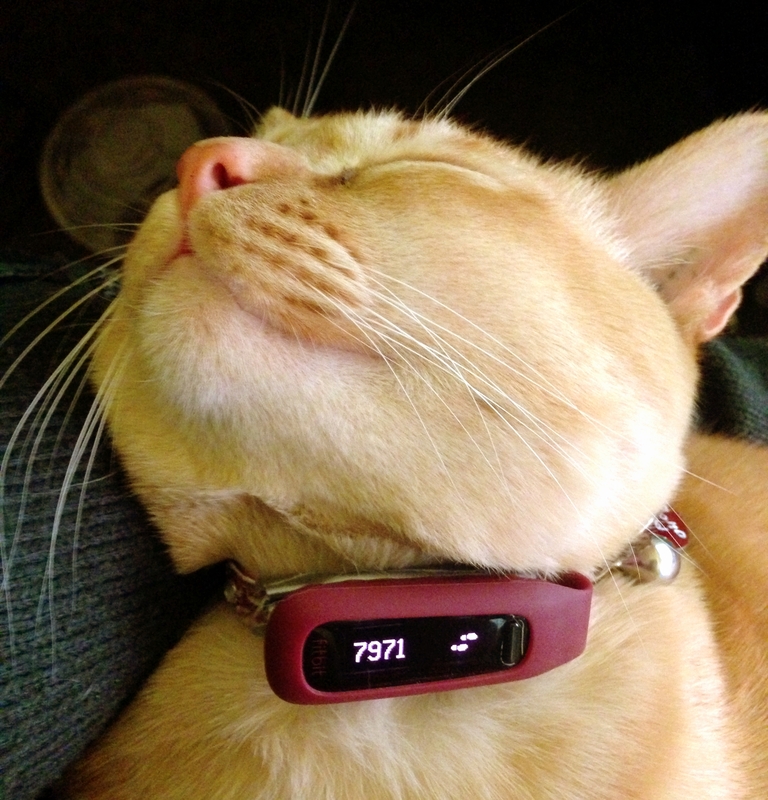 My cat Jasper favors Java and since cats, as pets, are new for me, and I love my fitbit flex this idea is so appealing. Don’t know how but the cat understood that pitbit is something stupid that didn’t give any profit from wearing it on the wrist or around the neck. I want to do what you did with your cat and track her steps. No reason really, just for funsies. But reading your post I realize it is somewhat handy to have something that lets me know whether or not she has traveled far from home if she does ever escape. I just have one question, should I get a fitbit one or just simply get a zip for my cat? I know someone who has a zip and is giving it away so I was just curious. Hi Kayla! Thanks for the question. If your friend is giving away the Zip for free then it will probably do the trick. Just keep in mind that the Zip is quite a bit bigger than the Fitbit One, so if you have a particularly small cat it might be annoying attached to the neck. The form factor of the One is great because it can run parallel with the collar and the cat doesn’t even notice it! 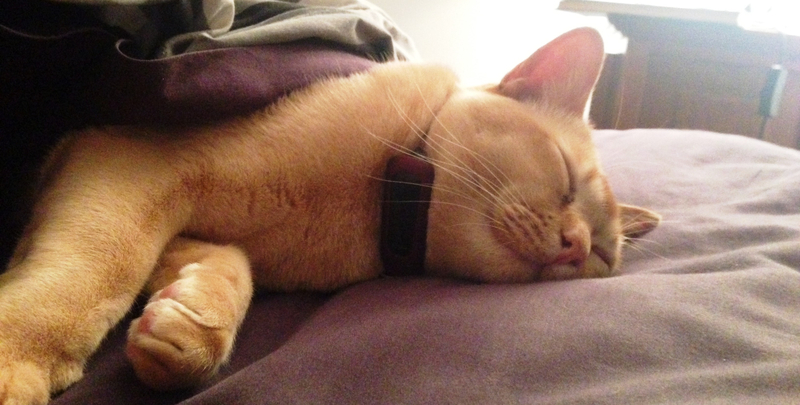 I have had a Fitbit Flex around my cats neck for about a week now. It is very interesting to track my cat. Besides counting steps, the sleep tracker is even more interesting. It was no surprise that his sleep pattern was very close to our sleep patterns mostly because whenever he was awake during the night, he had to make sure we woke up by jumping on the bed and climbing all over us. If you are wondering how I attached the Flex around my cat’s neck, it was simple, I just snapped two small wrist bands together creating a nice loose collar. At first I wasn’t sure if he would put up with having a collar on but he acts like there is nothing there and has not once tried to pull it off. 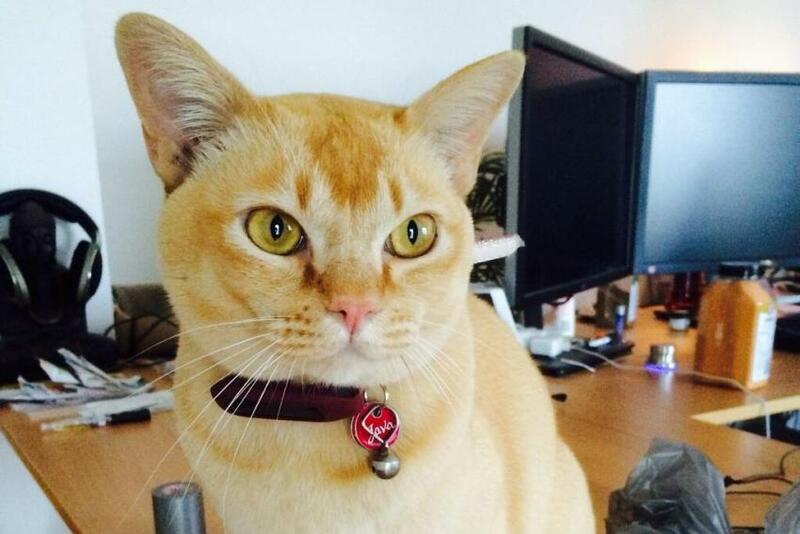 I am now searching the web for Fitbit Flex cat collars, I am sure some company in China has one available. For fun, I decided to do this with my mostly indoor cat. she clocked 5300 steps the first day. she must wander at night, because she had over 1800 steps by early this morning.